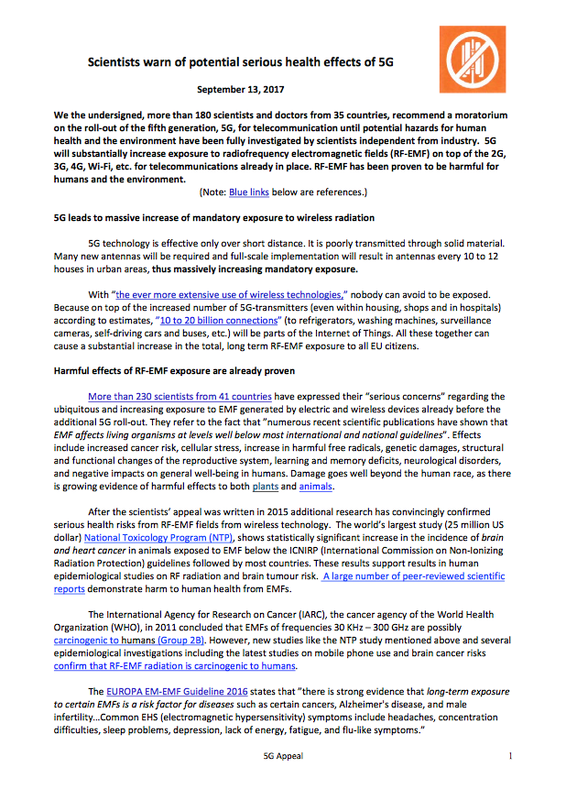 More than 230 scientists from 41 countries have expressed their “serious concerns” regarding the ubiquitous and increasing exposure to EMF generated by electric and wireless devices already before the additional 5G roll-out. They refer to the fact that ”numerous recent scientific publications have shown that EMF affects living organisms at levels well below most international and national guidelines”. Effects include increased cancer risk, cellular stress, increase in harmful free radicals, genetic damages, structural and functional changes of the reproductive system, learning and memory deficits, neurological disorders, and negative impacts on general well-being in humans. Damage goes well beyond the human race, as there is growing evidence of harmful effects to both plants and animals.